Looking for a fun, engaging way to have your kiddos practice their figurative language understanding? 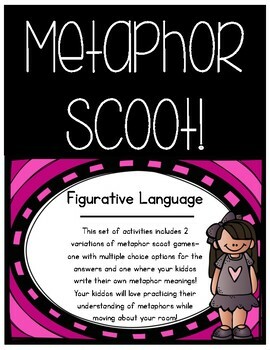 Check out this metaphor scoot! Each task card will give your students a sentence that includes a metaphor--their job is to figure out what it means! 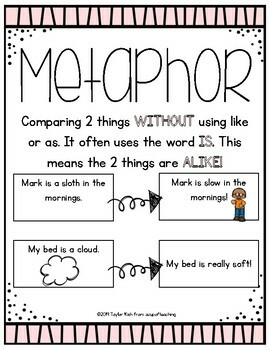 One set with multiple choice answers for your students to choose the meaning of the metaphor. 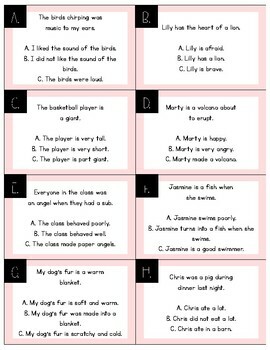 One set without the multiple choice answers for your students to write on their recording sheet what the metaphor means. It also includes a Metaphor poster that explains what a metaphor is! To use, simply choose the scoot you would like to use and print out the task cards on cardstock or laminate them. Then, scatter them throughout your room (or hallway!) and give each of your students a recording sheet. Your students will find the letter on each task card and match it to the box on their recording sheet to write in the correct answer. They'll "scoot" around the room looking for all of the task cards!